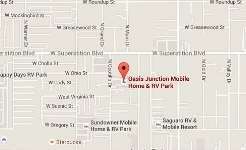 Oasis Junction Mobile Home & RV Park is a quiet 62 space park located in the heart of Apache Junction, Arizona. Our spaces are large enough to accommodate any size RV, 5th wheel or travel trailer. RV Spaces have concrete pads with 20, 30, 50 amp electrical service. 100 amp and 200 amp electrical service is available for mobile homes and park model homes. Don’t own an RV, 5th wheel or travel trailer? You can can lease one of our beautiful one or two bedroom park-owned homes on a long-term basis. All of our manufactured homes come with an awning and a storage shed. Our recently renovated on-site laundry facility is conveniently located in the center of the park. Individual resident mailboxes are also situated in the center of the community and there is an out-going mail slot to send those sun-adorned post cards back east. Water and trash pickup are included with the rent and our water lines have been recently replaced providing the park excellent water pressure and clean drinking water. Our park values the privacy and safety of its residents. A 6-foot perimeter fence surrounds the entire park and includes an entrance and exit for both the south side and north end of the park. Overhead security lights that operate automatically at nightfall are placed throughout the park. We also have an on-site manager. We are ideally situated off of the Apache Trail (Main Street) and are conveniently located close to shopping, retail and restaurants. The Superstition Freeway, U.S. Route 60, runs 2 miles south of the park which provides an easy commute to downtown Phoenix. 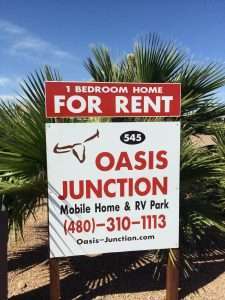 Oasis Junction Mobile Home & RV Park is a wonderful place to spend memorable moments with good people. Whether it is for a few months or on a permanent basis, nothing can beat the fantastic quality of life it has to offer.